Cultures the world over recognize that every life will end in death. However, many claim that some invisible but vital part of the human being—the spirit or soul—continues to exist after death. In some traditions, the individual possesses more than one soul, and each of these may have a separate fate. Religions throughout the ages have included a belief in an afterlife, a state of being that people enter when they die or a place to which they or their souls go. Myths, legends, and religious texts offer varying visions of the afterlife. These images reveal much about each culture's hopes and fears for the afterlife and often contain lessons about how people should live their lives. In some cultures, the afterlife is regarded as a place of pleasure and joy. In others, it is a gloomy shadow of earthly existence, a slow fading away, or a remote and unknowable realm. Expectations about the organization of the afterlife also differ. In some societies, everyone is thought to meet the same fate. In others, people are believed to take different paths, depending on the events of their earthly lives. Sometimes a judgment determines the individual's final destiny. Visions of Life After Death. Some cultures have associated the afterlife with a geographic location. The notion of an underworld beneath the world of the living is common. The peoples of ancient Mesopotamia!, for example, thought the dead lived on in a dusty, bleak underworld called the Dark Earth. Any pit, cave, or pond could be an entrance to that place. People on the islands of Melanesia in the southeastern Pacific Ocean imagine an underground world that is the mirror image of the upper world. Stories from the island of New Guinea describe an underworld that lies beneath the ocean. Divers have claimed to see the souls of the dead laboring in undersea gardens. In Navajo mythology, the dead descend into a watery underworld. According to the Ibo of Nigeria, the underworld is ruled by the goddess Ala, who receives the dead into her womb. Other cultures have placed the afterlife in the sky or among the stars. The Pueblo Indians of the American Southwest believe that the dead become rain clouds. Some Native Americans of the Southeast say that the souls of the dead dwell either in the heavens or in the west. The west has often been associated with the afterlife of the spirits. Polynesian islanders locate their ancestral island in the west and believe that spirits of the dead can return there. The Celtic* people pictured an otherworld that was sometimes underground or under the sea and sometimes an island in the west. Cerberus, the many-headed watchdog of Greek mythology, greeted souls when they arrived in the underworld. He also attacked them if they tried to escape. His image was a popular one with medieval artists. 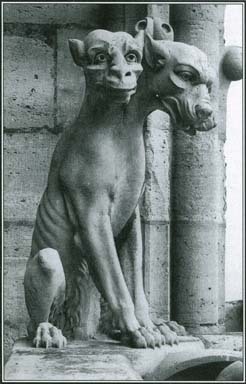 This sculpture of Cerberus can be found on Notre Dame Cathedral in Paris, France. feasting, singing, and indulging in playful combat. Their afterlife was not eternal, however. One day Valhalla and the world would be swept away in the gods' last battle. Not all warriors went to Valhalla. Freya, goddess of love and death, took half of them to her own palace in the afterworld. In contrast to vivid, lively, and joyous visions of the world beyond, the afterlife pictured by the peoples of the ancient Near East was dim and shadowy. The early Jews called their dismal, ghostly underworld Sheol. The spirits who dwelled in the Mesopotamian underworld felt neither pain nor pleasure but lived a pale, washedout version of life on earth, complete with a royal court ruled by Nergal and Ereshkigal, the king and queen of the dead. The Mesopotamian epic of Gilgamesh contains a description of the afterlife in which the hero's dead friend Enkidu returns as a spirit to describe existence in the "house of dust." Different Fates. Peoples of the ancient Near East such as the Mesopotamians and the early Jews believed that the afterlife was the same for everyone. Other cultures, however, have expected the dead to be divided into different afterworlds. The Polynesians believe that the souls of common people, victims of black magic, and sinners are destroyed by fire. The souls of the upper classes, by contrast, journey to a spirit world where they live among their ancestors. Some ancient Chinese people believed that the afterlife was different for good and bad people. The souls of good people rose to the court of Tien, or heaven, while the souls of bad people descended into one of the 18 levels of hell, depending on their crimes in the world. The Maya people of Central America believed that the souls of the dead went to an underworld known as Xibalba. To escape and go to heaven, the souls had to trick the underworld gods. Among the Aztecs of Mexico, slain warriors, merchants killed during a journey, and women who died in childbirth joined the sun in the heavens. The ordinary dead spent four years traveling through the nine layers of an underworld called Mictlan and then vanished on reaching the ninth level. In Norse mythology, warriors went to heavenly palaces, while other individuals ended up in a cold underworld called Niflheim, or Hel. Among the Inuit or Eskimo people of Greenland, a happy land in the sky is the reward for the souls of people who have been generous or have suffered misfortunes in life. Others go to an underworld ruled by the goddess Sedna. The Pima and Papago peoples of the American Southwest say that the spirits of the departed travel to a place in the east where they will be free from hunger and thirst. The rain god Tlaloc held an important place in the mythology of the Aztecs and other agricultural peoples of Mexico and Central America. Like many Aztec deities, Tlaloc had both a cruel and a kindly side. The Aztecs believed he was responsible for the deaths of people who died by drowning or of certain diseases such as leprosy. Yet Tlaloc then sent these people to a happy afterlife that ordinary Aztecs did not share. Wall paintings in the ancient Mexican city of Teotihuacán show the garden paradise that welcomed the souls of Tlaloc's dead. on the other. If the two balanced, the soul was declared sinless. A monster devoured those who failed the test. The Zoroastrians of ancient Persia* believed that the afterlife held a reward for the virtuous. Those who had lived a just life experienced a form of pure light that was the presence of Ahura Mazda, god of goodness, justice, and order. The ancient Greeks imagined the afterlife as a shadowy realm called the House of Hades, and they also spoke of a deeper pit of hell, Tartarus, to which those who had acted wrongly were sent to receive punishment. In Japanese mythology, the dead go to a land of darkness known as Yomi, where they may be punished for their misdeeds. After about 200 B . C ., the Jewish concept of Sheol gave way to a vision of judgment after death. The good entered the presence of God, while the wicked roasted in a hell called Gehenna. This influenced the Christian and Islamic ideas about hell as a state or place of punishment for evil. Heaven is the union of virtuous souls with God. According to the Roman Catholic Church, there is a state of being between heaven and hell called purgatory, in which tarnished souls are purified on the way to heaven. Many cultures have regarded death as the beginning of the soul's journey to the afterworld. The Etruscans of ancient Italy pictured sea horses and dolphins carrying souls to Elysium, the Islands of the Blessed. The ancient Greeks undertook a darker journey, asking a boatman named Charon to ferry them across the river Styx, which marked the boundary between the world and Hades. Many Pacific islanders viewed the journey as a leap. Every island had a reinga, or leaping place, from which the soul was thought to depart. For the Maoris of New Zealand, the place is the northern-most point of North Island. A sacred tree was often associated with the reinga. The Hawaiians believed that the souls of children lingered near the tree to give directions to the newly dead. Other Pacific peoples thought souls swam to the afterlife and that those weighted with sin would sink. In some cultures, bridges linked the living world and the afterworld, and the crossing was not always easy. The Norse bridge shook if someone not yet dead tried to cross it before his or her time. The Zoroastrians had to cross a bridge the width of a hair. The just survived the crossing; the unjust fell into hell. Both the rainbow and the Milky Way were thought by various peoples to represent the bridge to the land of the gods or spirits. The Fiji islanders of the Pacific spoke of a Spirit Path with many dangers, a journey so difficult that the only ones who could complete it were warriors who had died violently. A Native American myth of the far north says that the dead person's shadow must walk a trail that the person made during life. Along the way, the person's ghost tries to keep the shadow from reaching the heavenly afterlife. Other entries related to the afterlife are listed at the end of this article. The Egyptians believed that when their souls entered the afterlife, they would be weighed against a feather belonging to Maat, the goddess of justice and truth. the realm of spirits and of the dead. Welsh heroes entered the realm of Annwn, the king of the dead, to steal his magic cauldron. Greek legends tell of the journeys of Orpheus* and Odysseus* to the land of the dead. The Navajo believe that searching for the realm of the dead can bring death to the living. In his play Hamlet, William Shakespeare called death "The undiscovered country from whose bourn [boundary]/No traveler returns." Yet myths and legends from around the world say that the dead do interact with the world of the living, one way or another. In some cultures, the dead are thought to linger near the living as shades or spirits. Southeastern Native Americans believe that newly dead souls remain near their villages hoping to persuade others to join them. In some African myths, in contrast, the souls of the dead stay close to living relatives in order to help and advise them. To consult with their dead ancestors, Mayan rulers performed a blood-letting ritual known as the Serpent Vision ceremony. The belief that the spirits of the dead can do good or ill in the world of the living lies behind some forms of ancestor worship. Ghosts of the dead, whether malicious, helpful, or merely sad, appear in the myths and folktales of many cultures. The Chinese perform ceremonies to honor the spirits of their ancestors and ensure that they will have benevolent feelings toward their descendants. Some Native Americans honor the ghosts of their dead with annual feasts. However, the Navajo—who avoid dwelling on death—never mention the dead in their rituals. areas of Africa also believe that souls are reborn, perhaps after a period spent in the underworld. In many cultures, rituals associated with death were meant to help the deceased in his or her journey to the afterlife. The Greeks, for example, provided the dead with coins to pay the ferryman Charon. Although the Romans were less certain about the afterlife than the Greeks, they often followed the same custom and sometimes added treats for the dead person to offer to Cerberus, the three-headed dog that guarded the entrance to the underworld. The Tibetan Book of the Dead gives instructions for the soul to follow on its journey between death and rebirth. The ancient Egyptians believed that the body had to be preserved after death in order for the spirit to survive, and they went to great lengths to prepare for the afterlife. They built tombs to protect their dead. The most elaborate are the great monuments known as the pyramids. Within the tombs, they placed grave goods, such as food, furniture, and even servants, for the dead person to use in the next life. The Egyptians also developed an elaborate form of mummification to keep the body from decomposing after death. The full process could take as long as 200 days and was available only to the upper classes. The Egyptians provided their dead with written instructions, including advice on how to survive the hazardous journey after death and guidebooks to the afterworld. The afterlife took many forms but was often pictured as a comfortable existence in a luxuriant realm of rivers, fields, and islands, although the royal dead were said to join the god Osiris* in the heavens. Texts inscribed on the walls of royal tombs included prayers, hymns, and magical spells to protect the dead from the dangers of the soul's journey. 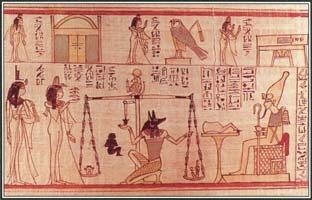 They were included in the most famous collection of Egyptian mortuary writings, the Book of the Dead, copies of which were often buried with the dead. The Mesopotamians usually made no attempt to preserve the bodies of their dead or to bury them elaborately. One striking exception is a set of royal graves found in the ruins of the ancient city of Ur, in what is now Iraq. The graves contained not only rare and precious goods but also the bodies of servants, dancing girls, charioteers, and animals, all slain to serve the dead in the afterlife. The early Germanic peoples also buried grave goods with their chieftains. A burial mound at Sutton Hoo in England contained an entire ship along with a quantity of gold and silver items. The grave goods of the Bushmen of Africa consist of the dead man's weapons. People preparing the body for burial coat it with fat and red powder and bend it into a curled sleeping position. Then they place it in a shallow grave facing in the direction of the rising sun. Other South African tribes follow a different practice: They break the bones of dead people before burial to prevent their ghosts from wandering. See also Ala ; Avalon ; Book of the Dead, the ; Cerberus ; Elysium ; Enuma Elish ; Gilgamesh ; Hades ; Heaven ; Hel ; Hell ; Orpheus ; Osiris ; Reincarnation ; Sheol ; Styx ; Underworld ; Valhalla ; Valkyries .